If you are one of the Internet online radio subscribers, then Slacker should not be something new for you. Slacker is an online radio website that provides unlimited radio channels to its subscribers through its own streaming box or other slacker capable devices. While its basic service has able to attract many online radio listeners, Slacker has further improved and announced a new Radio Plus service that allows users to have more customizable personal radio stations which were not available through its normal service. As of today, Slacker has already provided millions of online music with more than 100 programmable personal stations that users can enjoy their own favorite songs, artists and more. However, there are still some shortcomings in its basic service which are now being value added with the introduction of new Radio Plus service. 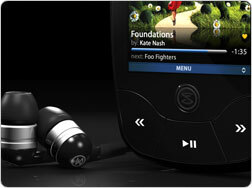 By now, users will have the capability to select any songs they like with unlimited song requests. Besides, they can skip as many songs that they like without any restriction until they found their own favorite songs to be added into their personal radio stations. Furthermore, users now can enjoy totally ads-free radio streaming as opposed to what being in basic service. Similarly to other normal Slacker service, the new feature will be available to any of the Slacker capable devices such as its famous G2 personal radio player as well as other compatible web players. While Slacker basic are still remained free of charge, users can enjoy a more advanced and value added service with Radio Plus at a basic of $3.99 per month.